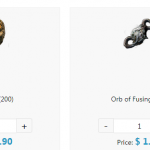 What is Orb of Augmentation? 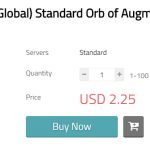 An Orb of Augmentation is a currency item that can be used to enhance a piece of magic equipment with an additional random affix. This can only be used on an item with one affix, since magic items can have at most one prefix and one suffix. What is Mirror of Kalandra? 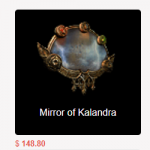 A Mirror of Kalandra (often refered to as just Mirror) is a currency item that can be used to create a mirrored duplicate of any piece of non-unique equipment, non-corrupted item, or map that is not itself a duplicate. It resembles the Path of Exile logo. A Cartographer’s Chisel is a currency item that is used to improve the quality of a map. 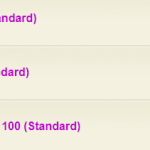 The amount of quality given depends on the rarity of the map. 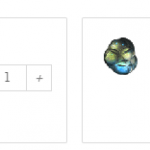 What is Glassblower’s Bauble ? A Glassblower’s Bauble is a currency item that can be used to improve the quality of a flask. The amount of quality raised depends on the rarity of the flask. 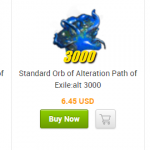 What is Orb of Alteration? 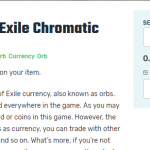 A Blessed Orb is a currency item that can be used to re-roll values of the implicit modifiers on a piece of equipment. 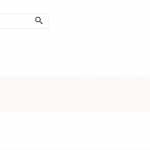 (This means the top values of an item above the line and not the bottom 6 values) This can only be used on an item that actually has implicit modifiers that can have a range of values. 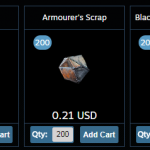 A Jeweller’s Orb is a currency item that can be used to re-roll the number of sockets on a weapon or piece of armour. 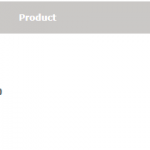 The maximum number of sockets is still limited by the type of equipment and item level. Vaal Orbs are a currency item that will corrupt an item, causing unpredictable and possibly powerful results. Once an item is corrupted, it can no longer be modified by any other currency. This includes restoring imprints from an Eternal Orb.